“The Cafe” commended as top 50 in the world, in the awards’ Open Street Photography category. 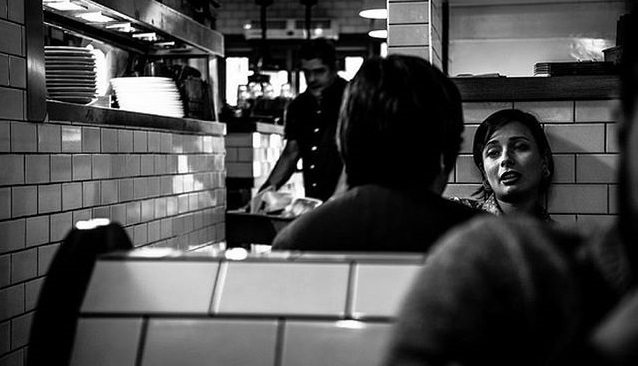 In April 2017 the judges of the 2017 Sony World Photography Awards honoured the work of British photographer Wayne Crichlow, whose image “The Cafe” was commended as top 50 in the world in the awards’ Open Street Photography category. Over 227,000 images from 183 countries were submitted to the 2017 Sony World Photography Awards. Wayne, who is based in Chafford Hundred, Essex was recognised as a commended photographer alongside the shortlisted photographers of the Professional, Open, Youth and Student Focus competitions, all of which are also announced today. Wayne Crichlow is a British born photographer from the suburbs of London. Having started his passion in photography with a modest bridge camera capturing family snaps, Wayne uses his skills to capture life events as they happen, at every opportunity. Intrigued by the creative freedom which photography brings and the power of the lens, Wayne experiments with composition and uses the latest technology to bring to life the emotion behind the subject. Wayne comments: “My composition begins in my mind as I watch. I am thinking how I can capture the image in a way that the viewer feels like they are there, but can also build their own narrative. Where is he going?, what is at the end of that tunnel? , What is she thinking? His commended image “The Café” was taken October 2016 while having a coffee with a friend in a small cafe in London. While they were talking he caught this scene shot over the shoulder of his friend of a woman and a man talking. This scene for him encapsulates the atmosphere of a busy cafe and a insight into the life of the people who go there. Wayne’s QUOTE about being commended. “When I read my email from Sony I must admit I was in a state of pleasant shock. I was encouraged to enter some competitions recently but always thought that the likelihood of my images standing out in a huge sea of exceptional photographers was very slim indeed. The Sony Photography Awards was the first competition I entered so I am overwhelmed that my image was commended. I have been visiting the Sony Photography Awards exhibition in Somerset House for a number of years and have been amazed by the work from truly inspirational photographers from around the world. To think that I will see one of my photographs exhibited there this year is truly humbling. Congratulations to my other fellow photographers who were also commended. The category winners for the Open competition was announced on March 28, and the overall Open Photographer of the Year title revealed on April 20 at an awards ceremony in London. Prizes included the latest Sony digital imagery equipment, and a $5,000 cash prize. As a commended photographer, Wayne’s image was also shown alongside the awards’ other commended images plus the shortlisted and winning images at the Sony World Photography Awards & Martin Parr – 2017 Exhibition in London from April 21-May 7. The commended image also now has a global audience having been published on the World Photography Organisation website. Produced by the World Photography Organisation, 2017 was the 10th anniversary of the Sony World Photography Awards and a decade-long partnership with its headline sponsor, Sony. Each year the awards recognize and reward the very best contemporary photography captured over the last year entered into any of the awards’ four competitions - Professional, Open, Youth and Student Focus. With 49 nationalities represented, the 2017 shortlists reinforced the awards’ international appeal and unique ability to present the greatest images taken by photographers from all corners of the world on a truly global scale. Each of the four competitions were judged anonymously by internationally acclaimed industry professionals, carefully selected by the World Photography Organisation. For full list of the 2017 judges, please click here. The World Photography Organisation is a global platform for photography initiatives. Working across up to 180 countries, our aim is to raise the level of conversation around photography by celebrating the best imagery and photographers on the planet. We pride ourselves on building lasting relationships with both individual photographers and our industry-leading partners around the world. We host a year-round portfolio of events including: the Sony World Photography Awards (the world's largest photography competition, marking its 10th anniversary in 2017), various local meetups/talks throughout the year, and PHOTOFAIRS, International Art Fairs Dedicated to Photography, with destinations in Shanghai and San Francisco.